Last Thursday, April 25, Calvin College hosted “Principled Pluralism: Navigating America’s Increasingly Diverse Religious Landscape”, a panel discussion on religious pluralism on college campuses, with Joseph DeMott moderating a discussion among Calvin’s president Michael LeRoy, Calvin Theological Seminary president Jul Medenblik, and Alec Hill, the president of InterVarsity Christian Fellowship. The panel discussion was sponsored by the Aspen Institute and GVSU’s Kaufman Institute, at the initiative of the latter’s founder Sylvia Kaufman. Sylvia has always been a strong voice for interreligious dialogue in western Michigan, and she is the driving force behind the West Michigan Academic Consortium, a forum for interreligious dialogue that includes Calvin College and several West Michigan institutions of higher learning. 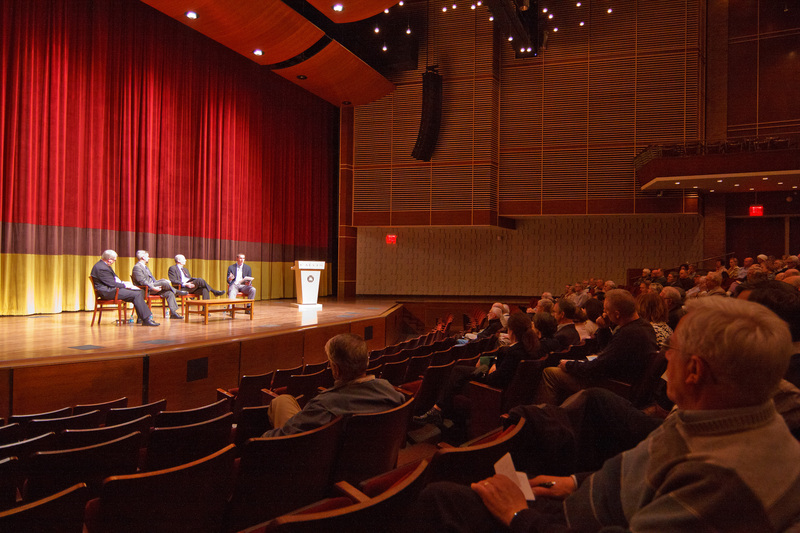 Calvin College has now hosted three of the consortium’s annual conferences, featuring Jewish (James Kugel), Christian (Karen King) and Muslim (Omid Safi) speakers. (Omid Safi’s presentation at Calvin College can be viewed here, starting at 9:31.) The next conference in this series will be hosted by Cornerstone University on October 14, 2014. 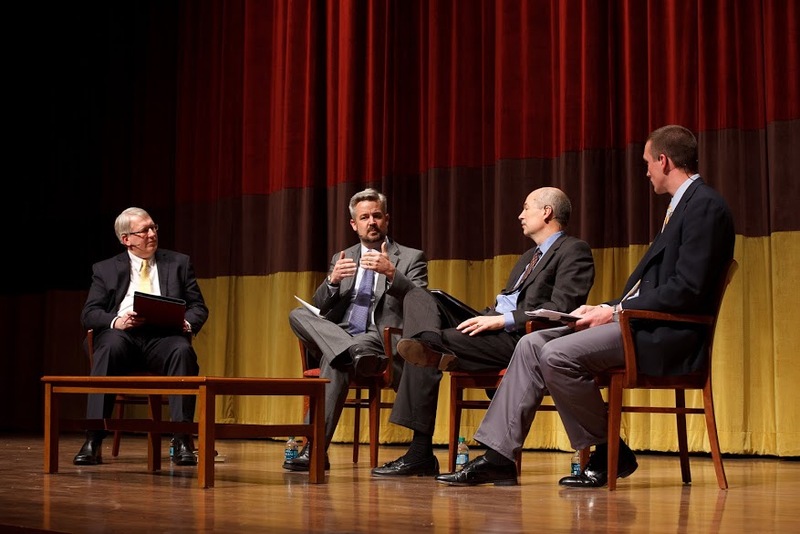 “Principled Pluralism” event, April 24, 2014. Image copyright 2014, photography by Ellen Alderink. It may seem ironic to hold a panel on religious diversity on college campuses that features only Christian speakers on a Christian campus. However, as President LeRoy pointed out in the discussion, being in a consciously Christian learning environment does not mean shutting oneself off from religious diversity or even interreligious dialogue; Calvin offers a Christian education that engages the world, not one that separates itself from it. The same is true of Calvin Theological Seminary, and both presidents offered meaningful examples of how Christians today can and should engage in religious dialogue. Here at Calvin, we most often encounter the first stance. Evangelical Christians often think that if one ball must be dropped, it is the ball of tolerance. The principle of tolerance, after all, is an inheritance of the Enlightenment, rather than the Christian tradition. We confess that Christ is “the way, the truth, and the life” (John 14: 6). And we believe that we should go “to all nations and make them [his] disciples” (Matt. 28: 19). This does make Christianity not particularly tolerant towards other religions. Saying that Christ is “the way and the truth” does not mean that “my religion is just as true as yours,” or that “what’s true for me may not be true for you,” two statements that are often associated with the idea of religious tolerance. Jul Medenblik, Michael LeRoy, Alec Hill, and Joe DeMott discuss religious pluralism on US college campuses. These fears are understandable, but they should not be barriers to interreligious dialogue. Engaging in interreligious dialogue need not mean giving up one’s own deepest-held religious convictions. Quite the contrary. Most who do take part in sustained discussions with believers from other faiths report being spiritually nourished and enriched through the encounter, and gaining a better appreciation of their own beliefs and traditions. Syncretism may also be a red herring. Christians sometimes see the specter of syncretism in places where we need not fear it, while we ignore it in places where it is much more prominent and pernicious. In the Sermon on the Mount, Jesus warned against religious syncretism only once. He said “You cannot serve God and Money” (Matt. 6:24). Here is a form of syncretism we should be much more worried about; yet many Christians are completely blind to it. Sometimes it takes skill to identify the idols of one’s own age. When it comes to religious poverty, we can learn much from other religions, such as Buddhism. Do we best testify to our beliefs by trying to convert our dialogue partners? We are called to share our faith with others, but there are different ways to do that in different contexts. Engaging in a dialogue in a spirit of humility and charity may be a more effective way of testifying to the love of Christ. I am glad that Calvin and Calvin seminary’s presidents at last Thursday’s panel modeled this kind of Christian witness. This entry was posted in Frans van Liere and tagged Aspen Institute, Calvin College, Calvin Theological Seminary, interreglious dialogue, Kaufman Institute, liberal arts, religion, tolerance. Bookmark the permalink. If you are interested in some new ideas on religious pluralism and the Trinity, please check out my website at http://www.religiouspluralism.ca. It previews my book, which has not been published yet and is still a “work-in-progress.” Your constructive criticism would be very much appreciated. 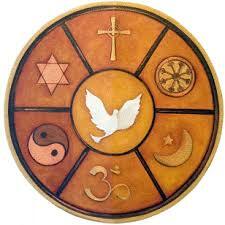 Interesting how Christians are so willing to engage in this amalgamation of world faiths. Let me say that no true Christian will. In the effort to appease, the casualty in this world of religious political correctness is the gospel of Jesus. Instead, folks in the name of world peace wish to hoist strange fire on God’s altar. We all know how that worked out the first time. Jesus says even today that he who confesses me before man; them will I confess before the Father and the holy Angels. What is being suggested in the interreligous arena is the abdication of the gospel in lieu of a perceived peace. Let me remind you all “Anti Christ” destroys many through peace. This is the wine of fornication, the wine of wrath in the Mystery Babylons cup and the world is becoming fast inflamed with it’s drunkenness.